(Generation #1) harvested the first official cranberry crop, establishing the farm in 1857. His daughter caught the eye of Joseph J. White, an up and coming cranberry farmer, engineer, and entrepreneur. In 1857, Joe Darlington’s great-great-grandfather, James Fenwick purchased a tract of land from his uncle that had been a part of Hanover Furnace (ironworks). Years earlier it had been clear cut of wood to fuel the furnace and mined for its bog iron ore, but native cranberries had begun to grow in profusion. By the 1840’s the area even became known as “Cranberry Run.” Starting with those wild cranberries, Fenwick began to care for the plants and cultivate them for their fruit. He kept improving the plants and eventually had about 60 acres of well-producing cranberry bogs. 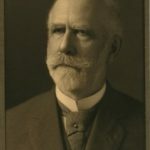 Joseph J. White (Generation #2; known as “JJ”) increased the cranberry farm from 60 acres to 600 acres, founded the farm village of Whitesbog, wrote the first book on how to cultivate cranberries, had over a dozen patents to his name; started a cranberry marketing cooperative; and helped to organize the American Cranberry Growers Association. The farm was incorporated using his name in 1912. Meanwhile, another of Joe’s great-great-grandfathers, Barclay White, was also cultivating native cranberries on lands known as Sim Place. When he was hired by the Federal Government to manage relations with the Native Americans, he knew his new job would require a lot of travel out to the western frontier and he sold his bogs. 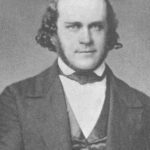 In the 1860’s Barclay’s son, Joseph J. White (JJ), was gifted some acreage by his maternal grandfather and he knew exactly what he wanted to do with it: cultivate cranberries! His bogs were named Rake Pond. In the years he was busy working on planting his bogs, he would stop at James Fenwick’s home to water his horse. Fenwick had a pretty daughter, whom JJ fell in love with and married in November of 1869. 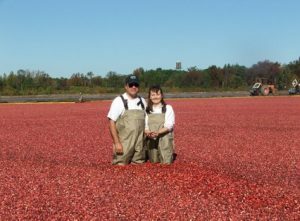 They spent their first winter together creating the first book on how to cultivate cranberries, JJ wrote it and his bride, Minnie, illustrated it. JJ then began to buy up lands surrounding his father-in-law’s bogs and to create bogs of his own. By 1882, when James Fenwick passed, although he had full confidence that his son-in-law would run his cranberry farm with integrity, he wanted his farm kept separate from JJ’s. His request was honored for the entire lifetime of Fenwick’s widow. When she died in 1911, JJ began the legal process that would unite the farms and incorporate them under the name Joseph J. White, Inc., which was finalized in 1912. He had two major reasons for uniting the farms: (1) the water management system was so interconnected that the lands really needed to be managed as one enterprise, and (2) he did not want the farm physically divided in the future, and incorporating created a “shares” system of ownership. Elizabeth C. White (Generation #3) was the eldest daughter of JJ White. She domesticated the blueberry, formed the Tru-Blu-Berry Cooperative, and made history in marketing, business, agriculture, and women’s heritage. JJ and Minnie’s eldest daughter was Elizabeth White. 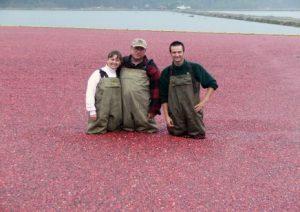 She grew up learning about the cranberry business from her father and had a passionate interest in the growing of a wide range of plants. She also loved the wild “swamp huckleberries” that grew in the periphery of her father’s bogs. 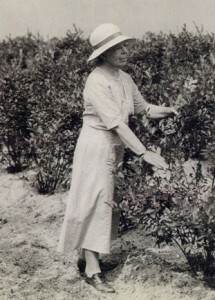 In 1911 she began a collaboration with Frederick Coville and by 1916 introduced the first commercially cultivated blueberries to the world. She would go on to make history in marketing, business, agriculture, and women’s heritage. 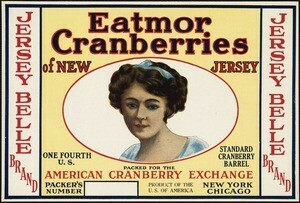 The cranberry cooperative founded by Joseph White was eventually renamed “Eatmor” and was part of the foundation of the marketing cooperative, Ocean Spray. Labels were coded by color, names, etc. For instance, the light yellow background meant the berries were from New Jersey. Other features told the variety, size, color, and quality of the berries in a particular barrel or box. JJ passed away in 1924, having expanded Fenwick’s cranberry enterprise ten-fold (from 60 producing acres to 600), built the farm village of Whitesbog, created what would become the Eatmor cranberry marketing cooperative (which was a predecessor to Ocean Spray), cofounded the American Cranberry Growers Association, and received over a dozen patents. Franklin S. Chambers (Generation #3) was JJ’s son-in-law and ran the company from the mid 1920’s to the mid 1940’s. Although Elizabeth was very active in the cranberry business, she did not become the President of Joseph J. White, Inc. upon her father’s passing. Her youngest sister’s husband, Franklin Chambers assumed that role, leaving her free to continue her development work on blueberries. Franklin was a musician and a mathematician, not a farmer, but he was interested in some of the more mechanical and business aspects of the farm and managed the company well until he handed the reigns to his nephew, Joe Darlington (the son of Beulah Darlington, another of JJ & Minnie’s daughters). 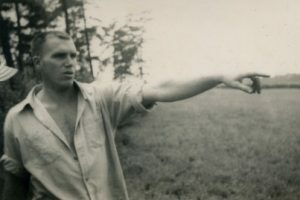 Uncle Joe Darlington (Generation #4) loved farming, but was tragically killed in a plane crash at the age of 31. As Joe Darlington (Uncle Joe) took over the farming operations, the industry was trying to recover from the devastation caused by False Blossom, a disease caused by a virus that is transmitted by an insect pest. Infected vines can’t produce any crop and there is no cure. So efficient replanting with healthy vines was the key to success. Uncle Joe developed the system of tilling the ground and taking mowings from healthy vines and spreading them on the loose surface. Then, by attaching a row of vertical discs to the bottom of a bulldozer blade, the vines could be pressed into the soil very quickly compared to the old method of hand-planting each vine individually with a dibble. Unfortunately, in 1948 at the age of 31, Uncle Joe was killed in a plane crash on the farm. 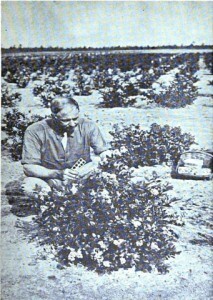 During his short tenure, Uncle Joe mechanized cranberry planting, helping the industry to recover from the False Blossom disease of the 1930’s. For 2 years the older generation did the best they could to hold things together and the workers kept working. The farm was for sale, but there were no buyers. So in 1950 the workers approached Tom Darlington, Uncle Joe’s younger brother, asking if he would consider leaving his engineering career and take the position of President of Joseph J. White, Inc. Just before harvest of that year, Tom, somewhat reluctantly, packed up his wife and 6-month-old son, Joe (named after his uncle) and moved to the farm. 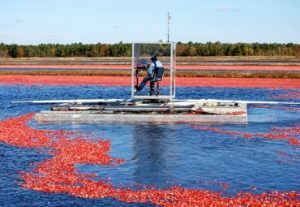 At that time harvesting cranberries was hard work, required a lot of people, and lasted from the day after Labor Day until (hopefully) the day before Thanksgiving. It didn’t take long before his engineering skills were applied to the farm and by 1952 Tom Darlington invented and patented the first widely-accepted mechanical cranberry harvester. We still use the “Darlington Dry Harvester” to harvest cranberries for the fresh fruit market. He also went on to mechanize blueberry harvesting and several other cultural activities that helped the farm continue to be a leader in the industry. Tom served on the Ocean Spray Board of Directors during 4 decades and become one of the original members of the controversial Pinelands Commission in an effort to represent farming interests. He retired in 1995 and his son, Joe, took over running Joseph J. White, Inc.
Joe Darlington (5th Generation) and his wife, Brenda Conner have complementary skills and are continuing to make history on the Joseph J. White farm, bringing many innovations to the cultural practices. The floating picker Joe invented to reduce plant stress and increase yield. Joe, like his father and great-grandfather, has talents in engineering. His wife, Brenda Conner, comes from a long line of Pineys and farmers; the best way to describe what she does is to say that she is the “interpreter” between the plants and the people. Together they have quadrupled the farm’s crop, introduced GPS technology to many of the farming practices, and invented a floating harvester to improve yields by reducing plant stress! Brenda is also known by family and friends for her cooking! She loves to feed people. So Joe and Brenda created Pine Barrens Native Fruits, LLC to share the blueberries and cranberries they grow and the recipes they enjoy with their own family with your family! They also invite you to meet them personally and see the farm first-hand through Pine Barrens Native Fruits Tours and Events. 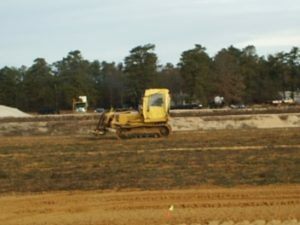 Joe and Brenda continue to work side-by-side with the entire team to grow the highest quality native fruits in the South Jersey Pine Barrens. They are diligent stewards of the water and land, and remain on the cutting edge in their cultural practices. Their son, Juddy, now works on the farm as well, using his passion for everything mechanical to manage the fleet of vehicles, tractors, equipment and implements for best efficiencies.